John Jacques, furniture maker and an associate member of the Gloucestershire Guild of Craftsmen, has been selected for the Crafts Council’s Hothouse programme starting in January 2014. John, who trades under the name Radiance Furniture, is one of 38 makers across England to be selected. All 38 have been in business for less than two years and already display a high level of technical craftsmanship and originality. The Hothouse programme will supply them with a tailor-made programme of business and creative support from established designers, makers and specialist professionals to assist them in the marketplace. Image: A glass topped half round console table made from English ripple sycamore and English walnut with an English oak centre piece. 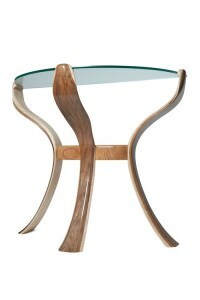 The legs ‘wrap’ over the glass top to make the overall structure elegant and strong. The shape is organic and is reminiscent of open flowers. This entry was posted in categories; Crafts Council.